Fortunately, laws in India have been changed. Now, a policy has been set so that in Kerala, doctors with at least 6 weeks of training, such as Dr. Rajagopal, can prescribe morphine for palliative care. (2) The rule was introduced in June 1998 in Trivandrum, the capital city of the state of Kerala. Since then, the central government has recommended this new rule to all the states in India. The idea of easier access to morphine and other pain relieving drugs was initially recommended by organizations and committees such as WHO Collaborating Center for Policy and Communications in Cancer Care (Wisconsin, USA). The Center is currently attempting to simplify complicated state narcotic regulations to further improve the availability of opioid analgesics. Through his organization, Pallium India, Dr. Rajagopal strives to provide Palliative and Hospice care to those that need it. Not only does Pallium India provide medical care to patients, but the organization also provides resources such as food and sewing machines to the patient’s family to help them get back on their feet. 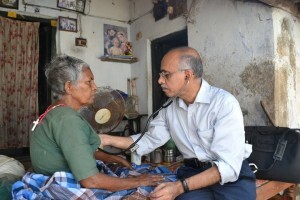 CFHI has partnered with Dr. Rajagopal to launch the Palliative Care In Southern India Program in Trivandrum, India that centers around Hospice and Palliative care. The CFHI participants involved in the program are given the opportunity to visit the patients and experience first hand how patients are treated and managed. Pallium India and CFHI have worked together to reform India’s Hospice and Palliative Care system. -Special thanks to guest bloggers Alexandria Tso and Nayanika Kapoor for contributing this article. This entry was posted in Cultural Humility, Global Health, Local Experts, Public Health and tagged cfhi, child family health international, Cultural Humility, Dr Rajagopal, Global Health Immersion Programs, hospice care, india, morphine addiction, pain management, Palliative Care, palliative care India, World Social Justice Day 2014 on February 20, 2014 by Guest Blogger.